You shouldn’t play every Far Cry game. You can, of course. I’m sure people exist who do buy and play every single one. But if you’re uncertain about Ubisoft’s most checklisty of map games, you should only check in on them occasionally. And when you do, you should try the Far Cry side stories first. 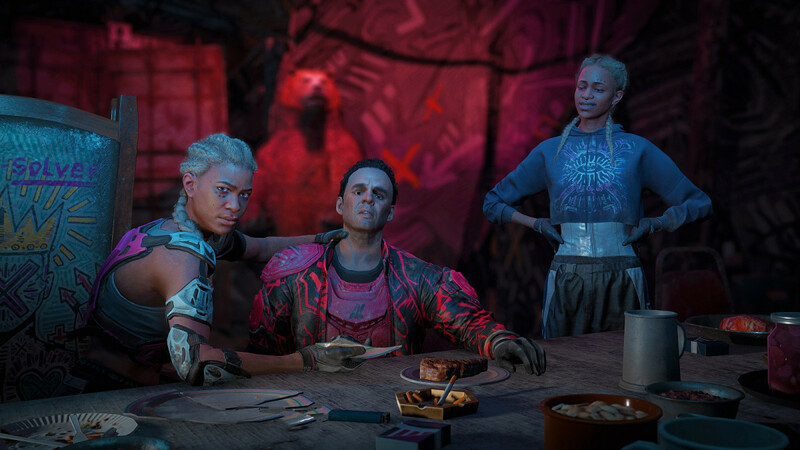 Far Cry: New Dawn is one of those side stories. Like Primal and Blood Dragon before it, the open-world shooter features new characters and missions, but it reuses the map from its most immediate predecessor. It is also a smaller, more manageable experience. Ubisoft reflects that reduced scale in the price. It sells these games for $40 instead of $60 … or instead of $20 depending on if you view New Dawn as a downscaled sequel or glorified expansion pack. But New Dawn has a lot to like. It’s smaller, but it also feels scrappy, like, somehow, a tiny team made it and not one of the biggest video game publishers in the history of the world. If you haven’t touched a Far Cry game ever, or in a few years, I would jump in here as opposed to anywhere else in the series. Ubisoft’s sales pitch for New Dawn is almost embarrassing. Every ad plays up that it’s the apocalypse but with a lot of pink and fuchsia coloring. And while that idea already feels worn out thanks to Bethesda’s Rage 2 using the same exact messaging, I think Far Cry: New Dawn looks great. Far Cry: New Dawn takes place in a world where the bombs fell. But they fell in nearby metropolitan areas and not in the backwoods of Hope County that you explore. So fewer people are stomping around the world, and nature has had a chance to reclaim the surface. That means the game is brimming with deep greens, and — yes — Ubisoft pops most locales with a splash of pink flowers. What this accomplishes more than anything else is creating a blue-sky chipper attitude that avoids the dour and depressing. I can appreciate a good dour and depressing world, but I’ve seen a million of them at this point. And games need to do a lot of work to counter the hopelessness of a bleak brown-and-gray pile of rubble. New Dawn doesn’t feel hopeless. Instead, you get the sense that you just need to overcome the human threat, and then the world is ready to provide whatever you need. For New Dawn, Ubisoft combines its welcoming environment with a relatively simple and understandable mechanical loop. You have a camp with a number of crafting tables and workbenches like a medical facility and helipad. You can upgrade every single one of these stations by going out into the world and finding materials. Sure, New Dawn has story missions and side quests, but the core of the game is building up your facilities. And it does a great job of putting the camp and camp upgrades front and center. Every time you return to your hub, you can look around and see everything that is upgradeable. Nothing hides. And I found myself going out in the world to find the hostile highwaymen enemies just so I could rob their resources to put into improving my garage. It’s basic, but I like that. It’s not going to overwhelm you. You can accomplish things and get tangible benefits, like better weapons and vehicles, without having to throw yourself into the game for hours and hours. The biggest problem with New Dawn is that it isn’t frivolous enough. This is a direct sequel to Far Cry 5. It takes place many years later, but you are in the same town and dealing with the same character or their offspring. The story has you working with various groups to take out the marauding Highwaymen gang that a pair of black women known as The Twins run. It’s all by-the-numbers Far Cry, and that means it’s easy to ignore. I imagine that some people will appreciate the idea of a shared-universe sequel story. But I think that’s a step backward for a developer that made a wild 1980s sci-fi action film riff with Blood Dragon. New Dawn a lot of what makes the Far Cry games work without a lot of the distractions. You explore a massive map, get into gunfights, and upgrade your character and camp. It’s just missing some of the production values of a “real” Far Cry, which means you’re not going to get as many voiced characters. And I’m OK with that. What is here is a manageable approximation of survival in a post-apocalyptic world. You have a ready-to-go camp that you just need to pour resources into. That’s a progression system that anyone can parse, and I appreciate that New Dawn doesn’t bog down its core experience. But it is still very familiar. If you’ve played a recent Far Cry, you can easily skip this. If you haven’t checked into the franchise recently, you’ll find a lot to like. But even you will wish Ubisoft did something more inspiring with the setting. Far Cry: New Dawn is out February 15 for PC, Xbox One, and PlayStation 4. Ubisoft provided GamesBeat with a download code for the purpose of this review. ← How is a high-fat diet related to liver damage? Pixel 2 vs Pixel 3: Should you upgrade?